The purpose of this report is to meet the Planning Committee remit from 6 October 2016 for a further report on Short Stay Commercial Visitor Accommodation (SSCVA). • any proposals being advanced in other cities to define this type of property in regards to commercial or non commercial. This report also provides an update on the Council’s enforcement action against this type of accommodation since the last update on 6 October 2016. 1.1.2 notes that a standard definition of SSCVAs is not achievable as each case has to be assessed individually as to whether a change of use has occurred. 2.1 Following the approval of Guidance for Businesses in December 2012, the Planning Committee considered whether SSCVA constitutes a material change of use in planning terms. The Committee considered that, in certain cases, it could. Accordingly, the non-statutory Guidance for Businesses was amended in February 2013 to incorporate the relevant criteria for assessing whether a residential property had undergone a change of use to a SSCVA. 3.1 Edinburgh has a history of short stay letting due to its popularity as a tourist destination and the presence of the festivals. These types of properties are advertised through a variety of letting agencies, private advertisements, websites and word of mouth. Consequently, information on their extent is difficult to gather. 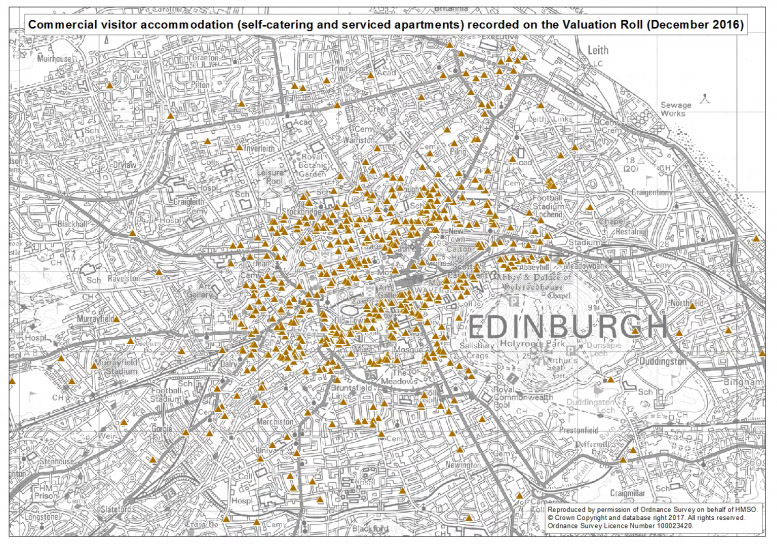 However, the rise to prominence of Airbnb and the public availability of its data helps to provide an indication of the current situation in Edinburgh. The data highlights the location of properties, length of time they are available for let and whether the entire apartment is available. A visual representation of this is shown in Appendix 1. 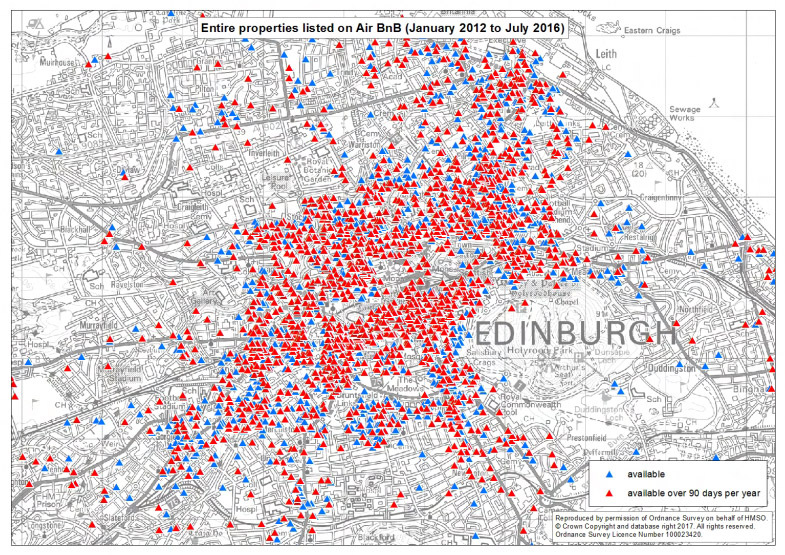 3.2 The data shows 6,273 properties in Edinburgh listed through Airbnb from January 2012 to July 2016. Of these, 3,432 (54.7%) are for entire properties, of which 2,043 (59.5%) were available for over 90 days a year. However, it should be noted that there is no current designation of sensitive areas in respect of SSCVAs and exact figures are therefore not available as requested by Committee. 3.3 Entire properties available as SSCVA for a significant proportion of the year indicate that the property is no longer used as a primary residence. A property primarily operating as SSCVA is potentially a commercial business which could require planning permission for a change of use. However, as outlined in the Guidance for Businesses, other factors such as the size of the property and the pattern of activity associated with the use will be material factors in determining whether a change of use has occurred. 3.4 The location of properties in Appendix 1 shows a concentration in the city centre towards Leith and the Southside. A larger concentration of properties available for over 90 days is concentrated in the city centre, with entire properties available for shorter periods dispersed across the city. 3.5 The concentration of properties in certain areas may bring issues relating to housing supply, noise and community cohesion. However, the designation of areas as ‘sensitive’ in relation to SSCVA risks underestimating the impact a single property may have on neighbours and, in the longer term, risks simply moving SSCVA outwith any designated areas. 3.6 Appendix 2 shows the 1,543 properties listed as Commercial Visitor Accommodation on the Valuation Roll in December 2016. With 2,043 properties on Airbnb alone, and available for more than 90 days a year, the valuation roll figure would appear at first sight to be an under-representation. If SSCVA properties not on the valuation roll are operating commercially, then a change of use in planning terms may have occurred. These properties would be no longer contributing to the housing supply. 3.7 The problem is that the planning definition of a commercial use is different from the Assessor’s definition, and just because a property is rented out for commercial gain, does not mean it is not in residential use. Each case has to be assessed on its own merits as to whether a change of use has occurred and whether action needs to be taken. For this reason it is not proposed to have a standard Council definition of SSCVAs. 3.8 Cities in the UK, Europe and beyond are taking measures to manage the unintended consequences of an increased use of Airbnb and other websites that enable SSCVA. Appendix 5 includes a summary of approaches to distinguishing between commercial and non commercial use. This need to manage SSCVA is linked to a shortage of affordable housing for residents and high demand for tourist accommodation. 3.9 A common theme is to use the number of days an entire property is let as an indicator of non-commercial or commercial use. The number of days used as an indicator ranges from 120 days in Paris to 60 days in Amsterdam. Glasgow does not give a definitive number of days but states that where a property is being used principally to provide short-stay accommodation, this may constitute a material change of use. The number of days an entire property is available to let indicates how often the property is used as a permanent residence and whether it can still be considered part of the housing supply. 3.10 Some cities consider all short-term lets of entire properties as constituting a change of use. In Amsterdam lets of fewer than seven days, in residential properties, are prohibited as they consider this type of let only appropriate for hotels and bed and breakfast which would constitute a change of use. Property owners in Berlin require a permit to provide SSCVA if over 50% of the property is to be leased. 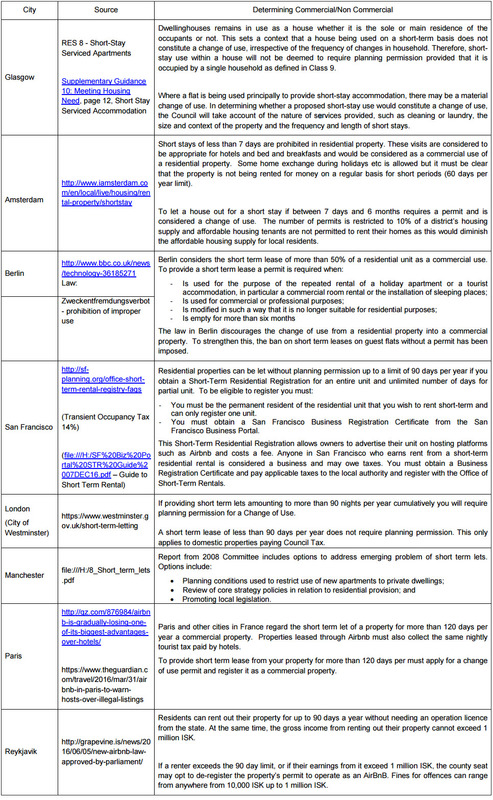 In San Francisco all those who lease property as SSCVA are required to have a Business Registration Certificate and anyone who earns rent from a short–term residential rental is considered to be operating a commercial business. 3.11 How waste generated from SSCVA is handled will vary depending on whether the use is classed as commercial or non-commercial. Commercial waste is defined as that which is generated by a business regardless of size. 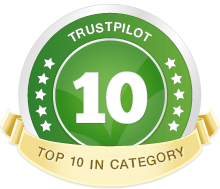 This includes those businesses which operate out of a shop, office, restaurant or home. The owner of the commercial business must organise the collection of waste from a licensed waste carrier. 3.12 Determining whether a SSCVA is generating commercial or non-commercial waste will depend on whether a change of use has occurred, irrespective of size or amount of waste produced. Ensuring waste is managed appropriately will ensure commercial SSCVA properties are operating consistently with traditional tourism business models. 3.13 Waste and cleansing services have highlighted the difficulty in enforcing compliance with trade waste regulations for SSCVA properties. This is a particular problem when isolated households are using their property for commercial letting, such as those operating through Airbnb, as the collector will be unaware whether the waste is residential or SSCVA waste. 3.14 Any visitors using SSCVA are subject to the city’s parking regulations. 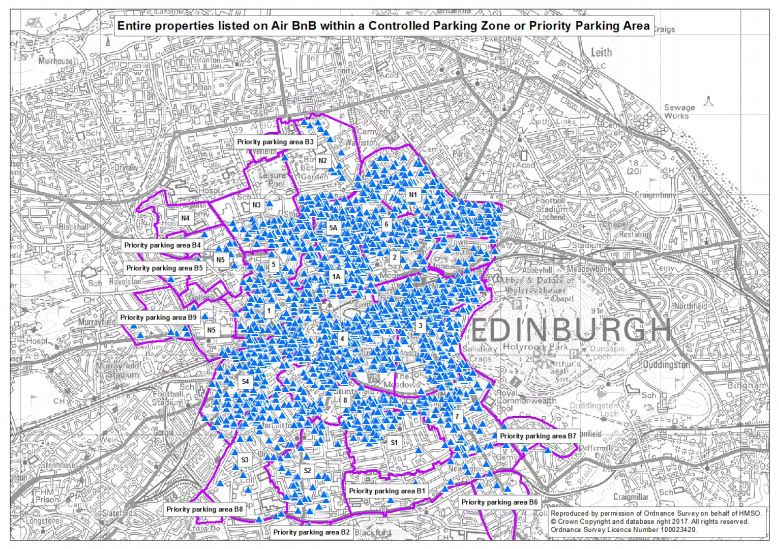 Appendix 3 shows the location of Airbnb properties within Controlled Parking Zones and Priority Parking Areas. Permits are available in these areas and a different type of permit is available for visitor parking which is more restrictive than residents parking permits. 3.15 Visitor Parking Permits are required to be purchased by a permanent resident of the zone. One permit lasts for 90 minutes of parking in permit holders or shared use parking spaces or the full controlled period in a Priority Parking Area place. In Controlled Parking Zones, permits are limited to 150 permits per year, or in Parking Priority Areas, limited to 30 permits per year. 3.16 A review of neighbourhood plans across Edinburgh identified priorities and actions linked to SSCVA. The city centre is one of the densest areas for SSCVA. Actions identified support encouraging people to visit and spend time in the city centre. Where antisocial behaviour does occur there must be a clear mechanism in place to raise issues. 3.17 The City of Edinburgh Council (CEC) has published advice for residents online for reporting issues associated with SSCVA. This includes noise, antisocial behaviour and too many people staying in one property. If these problems occur, the issue can be reported to the local neighbourhood office who will carry out an investigation and, where necessary, take action to resolve the situation. 3.18 Appendix 4 shows purpose-built student housing available to let during the summer months. These are mainly located outside the city centre in the Southside, Leith and Fountainbridge. The use of these student residences in summer equates to 35 buildings and provides a combined number of 8,479 beds. 3.19 Where student accommodation is let out for SSCVA uses over the summer months, this is unlikely to result in a change of use. The lease of student accommodation over the summer is used for a number of purposes including: • students who remain in Edinburgh over the summer; and • providing additional accommodation required for the Summer Festivals. 3.20 The main purpose of the accommodation throughout the year remains student accommodation. The use of the apartments as SSCVA over the summer months is unlikely to have a detrimental impact on the amenity of an area or loss of units from the housing supply. 3.21 If student accommodation is no longer being used as it was intended, and a change of use to residential accommodation is required, Policy Hou 6 Affordable Housing of the adopted Local Development Plan will apply. This requires conversions of 12 or more units to include provision for affordable housing. This amounts to 25% of the total number of units proposed. 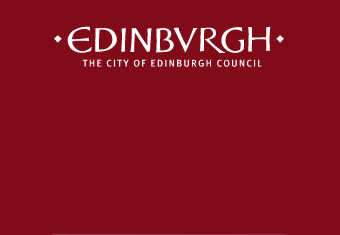 3.22 The Edinburgh Tourism Strategy 2020, prepared by the Edinburgh Tourism Action Group (ETAG), targets an increase in the number of overnight trips to Edinburgh of 680,000 per year by 2020. To reach this additional capacity, ETAG anticipates further development in the hotel industry and the continued rise in the use of Airbnb and other home sharing websites. 3.23 While the Strategy anticipates the further growth in Airbnb, the report acknowledges the challenges this brings. As well as the increasing impact on amenity and housing supply, ETAG highlights the challenges the growth of Airbnb will pose to traditional tourism business models. To mitigate the impact on traditional tourism business models, it is important that SSCVA properties, operating as quasi hotels or commercial businesses, are paying the correct property and business taxes. This will help tourism models operate on a level playing field. 3.24 The previous update to the Planning Committee (6 October 2016) stated there were ten SSCVA enforcement cases pending. Between August and December 2016, a further 11 cases were opened and 11 cases closed. 3.25 There are currently 11 SSCVA enforcement cases pending consideration. When investigating SSCVA, officers use site visits, speak to neighbours and owners and carry out online research to inform their analysis. 3.26 Of the 11 cases closed, one was subject to an Anti-Social Behaviour Order (ASBO). One other case was taken to appeal where the reporter gave general support to the Council’s Guidance for Businesses in assessing whether there was a change of use. 4.1 The Council’s performance in dealing with cases of SSCVA results in a decline in the particular problems associated with such uses, in a decline in the number of complaints about such activity, and in successful outcomes for the Council in any appeal or court proceedings. 5.1 If more properties were defined as SSCVA with the appropriate planning permissions, there could be benefits to the city in terms of increased rates and realignment of waste resources. 6.1 There is no impact on risk, policy, compliance and governance impact arising from this report. 7.1 The impact of better regulation of SSCVA on the amenity of areas and the city’s housing supply could aid in tackling some of the inequalities caused by the overstretched housing market in Edinburgh. 8.1 The impacts of this report in relation to the three elements of the Climate Change (Scotland) Act 2009 Public Bodies Duties have been considered. Relevant Council sustainable development policies have been taken into account. This review of the operation of SSCVA will have no adverse impacts on carbon emissions, the city’s resilience to climate change impacts, achieving a sustainable Edinburgh in respect of social justice, economic wellbeing or good environmental stewardship. 9.1 No formal public consultation has taken place as part of this report. However, there is regular contact and communication with community groups and other interested parties with regard to enforcement cases. Internal consultations have taken place with planning and building standards, waste services, parking, localities and community safety.